A splendid run of form just at the right time of the season has seen Stevenage transform themselves from mid-table obscurity to play-off certainties. Graham Westley’s side had suffered nine defeats in their opening 16 league and cup games of the season, while although they then won five from six around the Christmas period, another sequence of three consecutive defeats, stunted their progress once more. However, since a 0-0 draw at home to Bury on February 10, they have won eight, drawn six and lost just once, that a 1-0 home defeat to Dagenham, to climb above Luton to sixth in the table and secure a play-off berth. They’ve done it the hard way too, beating Plymouth, Newport and Northampton, while drawing at leaders Burton, with Saturday’s 1-0 success over Carlisle, meaning just seventh place is up for grabs heading into the final day. That saw Westley nominated for the April manager of the month award and although he was pipped by Southend’s Phil Brown, the boss can reflect on an excellent first year back in League Two for the club after relegation last term. On his team’s chances in the play-offs, Westley told the club’s official website: “I don’t think people fancy playing Stevenage, I think that they know Stevenage play to win and any team that plays to win and is prepared to go all in to win, is a tough proposition. “All we want to do is get better, we have been going on all right, I think that is eight wins, seven draws and a defeat in 16 now. Meanwhile, on his side’s trip to Kenilworth Road, Westley added: We hope we have got four games left this season and what we know at this football club is that winning is a constant. “It is not something that you can switch on or switch off, it is something that you have to be focused one every day. Something you have to be focused on every time you go to work. “We have worked very hard this morning to put ourselves in good shape for tomorrow’s game and tomorrow we will be working to win because that is what we know is the recipe for success. Team news: Hatters are without both Shaun Whalley and Ricky Miller who have been suspended by the club after being arrested and then bailed for an alleged incident with a taxi driver after the club’s end of season awards. Paul Benson sits out the last game of his ban, while Pelly Ruddock Mpanzu is out, with Alex Lawless doubtful, although Cameron McGeehan might feature and Elliot Justham should keep his place. Stevenage will be without on-loan former Hatter Keith Keane, who has returned to parent club Preston with a shoulder injury. Defender Darius Charles and forward Adam Marriott (knee) remain sidelined. Top scorers: Hatters: Mark Cullen (13). Stevenage: Charlie Lee (9). Milestones: Midfielder Jonathan Smith will make his 100th appearance for the Hatters if selected tomorrow. 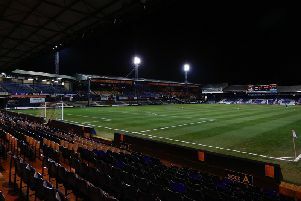 Average League Two crowds: Hatters: 8,641. Stevenage: 3,191. Man in the middle: Nigel Miller - County Durham referee has taken 33 games this season, showing 83 yellow cards and one red. Reffed Luton twice, the 1-1 draw at Bury in the FA Cup, plus Town’s 1-0 win at Carlisle United on the opening day. Previously, took Hatters’ 1-0 win over Derby County during the 2005-06 Championship season. Miller then officiated two goalless draws at home to Southend the following campaign and at Accrington in League Two during the 2008-09 season. Assistant referees for the game are William Bull and Nigel Smith, with Ian Dudley the fourth official. Spent five months in charge of Kingstonian, before moving to Enfield and then Farnborough Town in 1999. Led them to the Conference but then joined Stevenage in 2003, remaining until his contract expired in 2006. Had a brief spell with Rushden & Diamonds, and was then caretaker manager at Kettering Town. Took a year out of the game but was back at Stevenage in May 2008 where won the FA Trophy in 2009 and secured promotion to the Football League, seeing off the challenge of Luton in 2010. Enjoyed back to back promotions via the play-offs as he took Boro into League One, before he was appointed Preston North End managerat the start of 2012. Didn’t enjoy the best of times at Deepdale and was sacked in February 2013. Rejoined Stevenage in March 2014, but couldn’t keep them in League One last season as they were relegated, although has led them to the verge of an instant return by reaching the play-offs this term. View from the opposition: Dean Parrett speaking to the Stevenage Comet - “Luton are just outside (the play-offs), and it’s going to be a tough game as they’ve been pushing for it as well. Friendly faces: Ronnie Henry, Luton’s club captain last year, opted to return to Stevenage in the summer after he couldn’t agree on a new deal at Kenilworth Road. Made 87 appearances in total for the Hatters, leading them to the Conference title and has played 36 times for Stevenage this season, although hasn’t featured since March 30. Winger David Martin was released by Luton this term after playing 25 times for the Hatters, scoring three goals, before being snapped up by Stevenage on a free. Netted on his debut and has played nine times for his new side since. Boro defender Harry Worley had a loan spell with Luton from Leicester in the 2008-09 season, making 10 appearances for the club during his two months. He has only featured three times for Stevenage this season due to injury though. Stevenage also have keeper Tyler Reading, who started his career with Luton before joining Norwich City in March 2013. For Hatters, midfielder Andy Drury is well known to Stevenage fans as he had a fine spell at the club between July 2008 and May 2010, making over 50 appearances. He played in the club’s FA Trophy win in 2009, before moving to Luton for his first spell in May 2010 and returned at the start of the current campaign. One to watch: Ben Kennedy. 18-year-old Northern Irish attacker who has made a great start to life at Stevenage after coming through the youth ranks. Only made his debut back in January but has already scored four times in his 14 appearances as Westley said recently: “George Boyd was the most exciting talent I’ve ever had and he was always going to go all the way. “But it was in the early days, where he worked hard to build on the promise, that made him a Premier League player. “Ben, like many others that have gone before, can either capitalise on his chance and throw it away. We’ve got form: Luton were beaten 1-0 by Stevenage in their only clash at Kenilworth Road in the club’s history, that in the Blue Square Bet Premier during September 2009, with Scott Laird scoring the winner late on. Hatters: Mark Tyler, Ed Asafu-Adjaye (Claude Gnakpa 65), Alan White, George Pilkington, Adam Newton, Asa Hall, Jake Howells (Ryan Charles 88), Freddie Murray, Kevin Nicholls (Ben Wright 79), Rossi Jarvis, Tom Craddock. Subs not used: Shane Gore, Shane Blackett.